A parallelogram is a quadrilateral or four-sided figure in which the opposite sides are parallel. And because the opposite lines are parallel, hence the opposite angles are also equal. A rhombus, on the other hand, may be defined as an equilateral parallelogram. It is a four-sided figure which has all the four sides equal. This property of a rhombus is similar to a square. The distinguishing characteristic between the two is that a square has all the angles equal to 90 degrees, but in a rhombus only the opposite angles are equal. Still, there is a distinguishing feature that in a rectangle the opposite angle is equal to 90 degrees, but in the case of a rhombus, the angles are not equal to 90 degrees. They are supplementary angles. Thus we may say that every rhombus is a parallelogram but the converse is not true. A rhombus is also called as a diamond or a lozenge. We will take the help of the above figure to discuss a parallelogram and a rhombus one by one. The angle α=angle β and angle δ=angle γ. But angle α=angle β is unequal to angle δ=angle γ. The diagonals AC and BD intersect each other making a right angle (a right angle is an angle of 90 degrees) or are parallel to each other. The diagonals bisect the opposite angles. Circumference = 4 x side. The opposite sides are equal i.e., AB=CD and BC=AD. Each of the diagonals forms a triangle which is congruent to each other. Circumference = 2 (AB + BC). In a parallelogram, the opposite sides are equal whereas in a rhombus all four sides are equal. 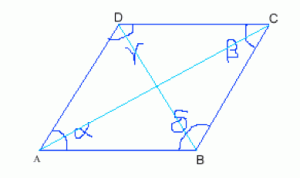 In a parallelogram, the diagonals bisect each other whereas in a rhombus they do not bisect each other. In a rhombus, the diagonals intersect each other at right angles and hence are perpendicular to each other. It is not so in the case of a parallelogram. In a parallelogram, the angles may be equal to 90 degrees, but it can never be 90 degrees in the case of a rhombus. A rhombus may be regarded as a subset of a parallelogram. Lathan K. "Difference Between Rhombus and Parallelogram." DifferenceBetween.net. November 6, 2018 < http://www.differencebetween.net/science/difference-between-rhombus-and-parallelogram/ >.